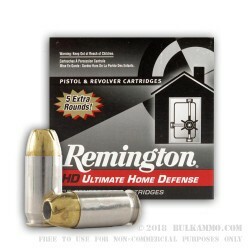 This 45 ACP cartridge from Remington’s HD Ultimate Home Defense line of ammunition is loaded with a 230 grain brass-jacketed hollow point projectile, the original bullet weight for its caliber. 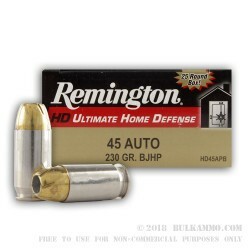 Based heavily on the Golden Saber line of ammunition, this hollow point bullet's brass jacket ensures better weight retention and deep penetrate targets. The jacket’s nose is cut completely through to promote controlled expansion to well over 1.5 times its original diameter, and the spiral pattern nose cuts in the bullet’s tip produce large, damaging petals as the bullet mushrooms outward. 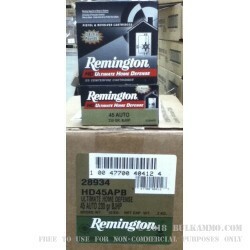 The result is indeed a cartridge that you can entrust your home’s safety to. This round additionally features a nickel plated brass casing. The shiny nickel not only facilitates chamber checks in low light conditions, but also facilitates feeding and ejection. 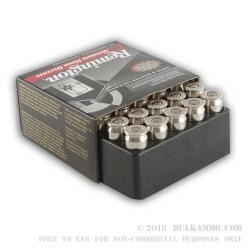 Along with its non-corrosive Boxer primer the casing is suitable for handloading, so you can defend you home for a very long time with these 25 rounds.